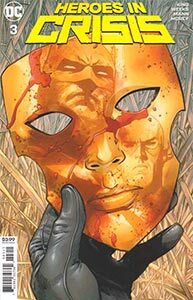 Issue Summary: In a series of flashbacks, several heroes are seen participating in their psychological therapy in Sanctuary. Lagoon Boy seeks help to overcome the memory of being struck by a laser. Wally West wants to remember his lost children. Story Notes: Seen in flashback, all of the events of this issue take place prior to the first issue in this series. 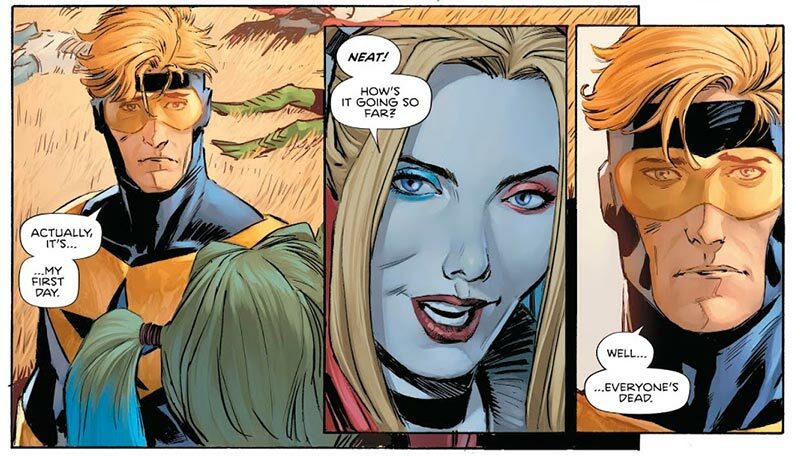 Seen in flashback, Booster Gold arrives at Sanctuary and is greeted by three people who were revealed in Heroes in Crisis #1 to be lifelike robots. (Sanctuary looks like Clark Kent's childhood home, and the appearance of the robots look to be based on Superman's parents and childhood friend, Lana Lang.) It is unclear if Booster recognizes these are artificial people, though his x-ray goggles should easily reveal the truth. In Booster Gold Volume 1, #23, Booster said that androids were common in the 25th century, so he would presumably spot them in the present day. The robot custodian informs Booster that the masks at Sanctuary are optional and are used to protect secret identities. So far in this series, only Booster Gold and Wally West (the Flash) are the only characters seen wearing them. HAIR CLUB FOR HEROES: Booster Gold uses the technology of Sanctuary's "Chamber" to have a conversation with himself. Does this take place in a room (like a Star Trek holodeck) or is it all in his head? The artificial Booster reveals one of Booster's insecurities: his thinning hair. This joke is first told in Booster Gold, Volume 2, #33. However the Chamber works, Booster is able to physically interact with his duplicate. He is also able to hear the Sanctuary emergency alarm when it goes off. Boosterrific Review: The series is improving as it goes on. For the first time, the series is making effort to make the reader care about the heroes who have died. Though it's impossible to believe that the murders are as cut-and-dried as this issue would have us believe, this is definitely a step in the right direction.